Maps have different characteristics of size, design, terrain, location, weather and land leveling. 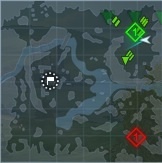 Each map offers different tactics to different tanks. Use these tactics as an advantage for you to conquer the maps.